History has seen various rulers who have achieved great military feats, but it rare to find someone who has fought uncountable battles with minimum bloodshed. Saladin is an example of one of the finest rulers of all time who conquered less through bloodshed and more through kindness. An-Nasir Salah ad-Din Yusuf ibn Ayyub, or more commonly, Saladin, is a Sunni Muslim of Kurdish ethnicity. He was the father of the Ayyubid dynasty that reigned in Egypt from 1174 to 1193. Born in Takrit, Iraq, Saladin was the son of a warden called Najm ad-Din Ayyub who later settled in Mosul with his family. Saladin’s father later became a part of the military, so he sent his son, along with his brother, to learn the arts of politics and warfare. Best known for his military accomplishments in battle against the crusaders, Saladin attained the biggest victory of his life by defeating them and conquering the holy city of Jerusalem making it an Islamic state. Saladin established a successful empire as a result of his religious devotion, and he is known to have unified several major Islamic states under his reign. 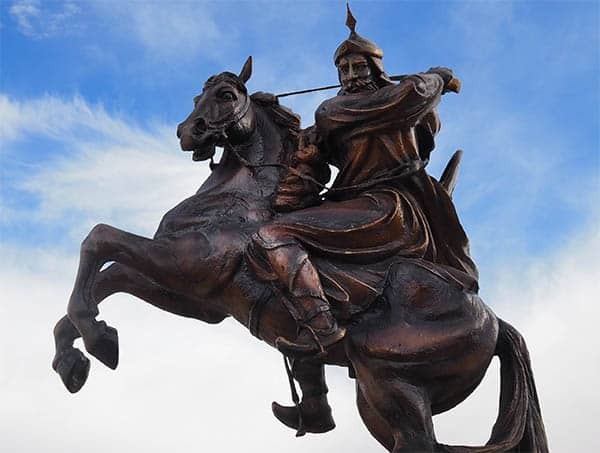 Saladin is best known to the world through his military conquests but there was much more to him than that, and these little-known facts throw even more light on the success of his reign. Below is a list of the top 10 most interesting facts about this prominent figure in Islamic history, Yusuf ibn Ayyub, or as everyone calls him, Saladin. European crusaders. He chose not to do this, but instead demonstrated a compassion that nobody was expecting. While the Christians were praying for their lives, he proposed a free passage to all Christians and the defeated armies too. Women, children, and the elderly were given special protection which won respect for him from all nations. He was not only a golden figure for Islamic followers, but Jews and Christians equally respected him for his kindness. As their enemy, one would expect Saladin to be hated by the crusader nations, but he emerged as a highly significant figure for them too. Around 1175, while reigning peacefully, Saladin faced a threat. This was an Ismaili division which was led by Rashid ad-Din Sinan and known as “the Assassins.” Various incidents occurred which led Saladin to suspect that a murder plot was underway. A poisoned dagger was found near his bed in his tent while he was sleeping, and on another occasion he was deeply wounded when two of the assassins dressed as soldiers stabbed him with a dagger. In order to put an end to these threats, Saladin’s army found the assassins’ headquarters and threatened to destroy their fort. The warning was taken seriously and a peace treaty was proposed. The treaty was signed by Saladin and Sinan which established favorable relations between the two. After the first defeat of Jerusalem, the Third Crusade was launched against Saladin by European leaders including the King of England, Richard the Lionheart. Saladin’s army fought various battles against the Third Crusade and but in their hour of need, he offered his help even to his enemy. Saladin is believed to have helped Richard through his illness by sending him his personal doctor. A fable also grew up that when King Richard’s horse was killed on the battlefield, Saladin sent his troops to the king to offer him fresh horses so that Saladin would not profit from the king’s disadvantage and a fair contest was maintained. Saladin is believed to have conquered people by winning their hearts and that is what he did with King Richard, showing modesty and fair play. This gesture was not in vain as King Richard was impressed, and even after beating Saladin’s army he proposed a truce which later led to the signing of an important treaty between the two parties. The treaty agreed to Jerusalem being under Muslim rule but with the insurance of safe pilgrimage passage for Christians. The rulers had a positive relationship after this. Saladin is credited with various religious accomplishments in the name of Islam. He is known to have fought countless battles against the crusaders. His conquests show his successful attempts at expanding Muslim sovereignty over various regions that had been ruled by the crusaders and a few non-crusaders too. Under his reign, he spread Islamic rule to places such as Yemen, Jerusalem, Syria, and Mosul among others, showing the extent of his military achievements. He is still deeply respected among Muslims, Turks, Arabs, and Kurds for his indisputable contributions to the unification of various Islamic states. Saladin was just 14 when he started training for his military career. He followed in the footsteps of his uncle Asad al-Din Shirkuh who was a high-ranking military official under the reign of the Emperor of Damascus, Nur Ad-Din. Shirkuh taught and molded Saladin into the competent officer he went on to become. Saladin fought alongside Shirkuh in every battle. He also helped him to win the Battle of al-Babein which is considered to be one of the most remarkable battles in history. He assisted Shirkuh in removing Shawar from power in Egypt which later led to the defeat of Egypt and the conquering of the Egyptian kingdom. A year later Shirkuh died making Saladin both head of the army and Emperor of Egypt at the same time. The Battle of Hattin marked the defeat of the First Crusades and led to the capture of the holy city of Jerusalem. As soon as European officials heard about this, they decided to form a new crusade to send into battle against Saladin. In order to establish this new crusade, English officials introduced a new tax which was called the Saladin tithe. It was a 10 per cent tax on the revenue from property which was collected by respected priests, bishops, and the deans of local churches. People who refused to pay the tax were imprisoned. While the tax was heavy and the amount collected was the largest that has ever been raised through tax, it was never used for its real purpose. King Henry, who ordered this tithe, never did send a crusade to fight Saladin’s forces. While Saladin was an avid student of various subjects and an established military officer, he was also strictly religious. It is believed that he was more interested in studying religion than military intelligence. Many religious institutions were established to spread the Islamic principles that he followed. He ordered the establishment of Madrasas to spread Sunnism in Egypt. His enthusiasm for studying the Quran and religious science was greater than his interest in politics and fighting and although he excelled in both these areas, Saladin’s knowledge of and devotion to his religion led him to spread this a lot further than any other ancient Muslim emperor. His devotion to Sunnism led him to spread it throughout Egypt and halt the rise of the Ismail Shia caliphate there. During his expedition to Egypt, Shia Fatimid Caliph al-Adid declared Saladin as the vizier, or high official. Saladin, through his post as vizier, quietly started rebelling and weakening the Fatimid system to spread his Sunni beliefs in Egypt too. Later in the year 1171, after Shia Calipha al-Adid’s death, Saladin fully removed the Fatimid caliphate from the land and became the Sultan of Egypt. Saladin was a keen student. Being of Kurdish extraction, he learned both the Kurdish and Arabic languages. He read histories and biographies of Arab rulers with interest and loved Arabic poetry. He learnt the Arabic book Hamasah with all its 10 editions by heart. As well as his knowledge of Arab rulers, he was also enthusiastically knowledgeable about the bloodline of Arab horses, making him one of history’s greatest students. After defeating the crusaders in Jerusalem, Saladin ordered the foreign people to return to their own lands in peace but for the many residents who were held captive under his reign in Jerusalem, Saladin proposed an alternative. Anyone who wanted to be free could buy his or her freedom by paying a small price in gold coins. For a child’s freedom it was one coin, for a woman it was five, and for a man it was 10. For those who could not pay for their freedom the only option was to be held captive forever or to be sold into slavery. Saladin’s reputation as history’s greatest military officer might dominate the history books but his chivalry and kindness as a human being greatly outshone his other accomplishments. History has never witnessed a ruler who was so admired by the people he defeated. Saladin’s preaching and behavior left an impression so deep that he is still respected not only by Muslims but also Christians and Jews. His preference for religious studies over war can be seen by the methods he used to defeat his opponents, and it may have been his unconventional theories of fighting which led him to conquer so many. Yet with each battle, he managed to establish a positive relationship with his opponent. Even though he was a strict follower of Sunnism, he never took part in or encouraged religious conflicts. For sure, he shared the blame for the hundreds of casualties resulting from his battles, but unlike other emperors and sultans, he spread the message of peace in his own way. Saladin will forever be remembered as a great name in history not just in Islamic states but also as a role model for every ruler. People can learn lessons from his compassion and kindness that even touched the lives of his opponents leading them to become his well-wishers too. Saladin features in Western and Muslim history as a golden figure who was the face of compassion and empathy. With all his successful conquests and admirable qualities he is, to date, considered to be the most powerful and greatest emperor of the Islamic dynasty. Many poets and writers have spoken of his greatness through their works, for example, the poem The Divine Comedy by Dante Alighieri or the novel The Talisman by Sir Walter Scott. From these works, generations are able to learn how he managed to balance power with generosity.